Korea International School said Thursday it will continue to expand its education to develop students’ artistic creativity and visual communication skills. KIS focuses on nurturing well-rounded students who challenge themselves to think critically and communicate visually. The school held a fall art exhibition last month, comprised of creative pieces by students in pre-kindergarten to 12th grade. Under the theme of “Chroma,” the exhibition featured a multitude of color celebrating the diversity of experiences and ideas that students brought through their art. “Students self-curate their work, reflect on their outcomes, and receive valuable feedback from visitors and fellow students alike. 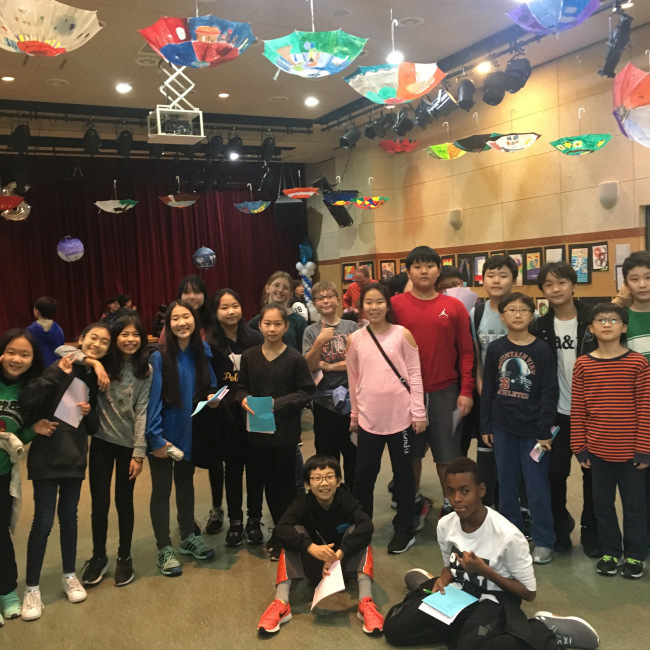 Young artists at KIS are also able to see themselves as real artists and envision a future path in the creative arts,” said Candice Kim, head of the Visual Arts Department at KIS. In an effort to expand the reach of their art skills and in conjunction with the KIS Service Learning initiatives -- a program which KIS has launched to help students participate in service to grow together as a community -- students from the elementary to high school collaborate to create a coloring book. All proceeds from this activity go to the Nabiya cat shelter, the school said. Each fall, art students participate in charity activities utilizing their artistic skills. Since 2015, middle school students have been making coloring books. The following year, the school also hosted a silent auction of student-made potteries to benefit orphanages in Suji and Suwon. Catherine Kim is one of the KIS students who have been reaching out to the community through the program since 2013. She has been applying her artistic knowledge by offering mentoring to underprivileged students from 1st to 6th grade at Chungsol Community Welfare Center. Through the National Art Honor Society, Kim also formed a committee of dedicated volunteers. “The most rewarding thing about teaching other students has been the reciprocal learning, which taught both myself and the students,” she said. KIS said it will host Fine Arts Week from April 16-20. This weeklong event will focus on how to appreciate art outside the classroom and apply it throughout all areas. Students in the Advanced Placement art course will sponsor a gallery showing slated for May 21-25. “It will be a culminating experience highlighting all of the technical and creative skills they have acquired throughout their art career,” KIS said.